This paper examines the extent to which the emerging world trading regime leaves nations the “policy space” to deploy effective policy for long-run diversification and development and the extent to which there is a convergence of such policy space under global and regional trade regimes. We examine the economic theory of trade and long-run growth and underscore the fact that traditional theories lose luster in the presence of the need for long-run dynamic comparative advantages and when market failures are rife. We then review a “toolbox” of policies that have been deployed by developed and developing countries past and present to kick-start diversity and development with the hope of achieving longrun growth. 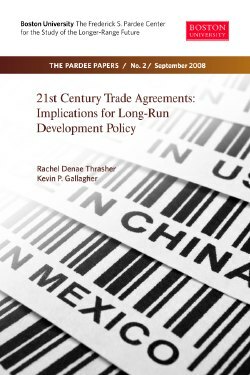 Next, we examine the extent to which rules under the World Trade Organization (WTO), trade agreements between the European Union (EU) and developing countries, trade agreements between the United States (US) and developing countries, and those among developing countries (South-South, or S-S, agreements) allow for the use of such policies. We demonstrate that there is a great divergence among trade regimes over this question. While S-S agreements provide ample policy space for industrial development, the WTO and EU agreements largely represent the middle of the spectrum in terms of constraining policy space choices. On the far end, opposite S-S agreements, US agreements place considerably more constraints by binding parties both broadly and deeply in their trade commitments. Rachel Denae Thrasher holds a master’s degree in International Relations and a law degree, both from Boston University, and she is a Research Fellow at the Frederick S. Pardee Center for the Study of the Longer-Range Future. Her recent research has focused on policy issues related to regional trade agreements, multilateral environmental agreements (MEAs) and on global forests governance. Kevin P. Gallagher is an Assistant Professor in the Department of International Relations and Research Fellow at the Frederick S. Pardee Center for the Study of the Longer-Range Future, both at Boston University. He is also a fellow at the Global Development and Environment Institute at Tufts University. He has written extensively on trade and global development. Also see related publication The Future of the WTO, by Kevin Gallagher.